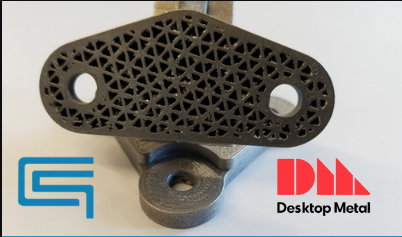 SI2 Technologies, Inc. produces functional parts for the Department of Defense with their RIZE ONE 3D printer up to 6X faster and at a cost savings of $2K per part. They wanted one machine that could combine 3D printing and inkjet printing capabilities. SI2’s core mission is to ‘make things smart’ by pushing the boundaries of where antennas can be placed and how they can be made. SI2’s mission requires the latest technology and innovation in the additive manufacturing field to deliver an advantage to the warfighter. Much of the development work that SI2 does happens in their state-of-the-art facility. Among their collection of modern equipment, SI2 has 3D printers ranging from entry-level consumer 3D printers to much more expensive and complex wide-format inkjet equipment. Although SI2 had a range of 3D printers and wide format inkjet printers, they didn’t have a single machine that could combine these two capabilities. RIZE’s patented hybrid Augmented Deposition process solved this problem, simultaneously extruding engineering-grade thermoplastic and jetting functional inks precisely where they are needed in the part. One recent application where SI2 used their RIZE ONE 3D printer was to produce an end-use airflow controller for an airflow chamber apparatus. The apparatus was designed in SOLIDWORKS and printed in four separate pieces on the RIZE ONE that were later bolted together into one unit. These parts were then incorporated into a larger chamber where they will help control the flow of air. Additional pieces can be introduced at a later time to further direct the airflow. Aaron Rathmell, Senior Scientist at SI2, said he selected RIZE for this application because, unlike his other additive manufacturing technologies, he was confident that RIZE ONE would produce the four large parts required for the airflow chamber apparatus without warping. Part accuracy was critical for the apparatus because the parts must fit together precisely, as well as on the sheet metal adapter base, so air doesn’t flow out of any cracks between parts or between the parts and the base. Dr. Rathmell also mentioned that release ink jetted by RIZE ONE enables fast and simple post-processing. Without the RIZE ONE release ink capabilities, the type of supports needed for the air chamber parts would require much more complex post-processing work on other 3D printers. “The only alternative to RIZE for these parts would be injection molding at a cost of $2K per part and a turnaround time of approximately 3-6 weeks. We had a deadline of one week to deliver the assembly to our client. With RIZE, we met our deadline at a cost of $143,” said Aaron. SI2 has also used their RIZE ONE to produce a 4”x4” Vivaldi Notch test apparatus. Eventually, this test apparatus will be scaled up to full size for a military application. Aaron and his team mounted an antenna onto one side of the test fixture and a splitter on the other. It was fed with passive splitters where a two-way splitter fed a pair of eight-way splitters to provide an equal excitation to all 16 channels. The array apparatus, complete with the array and splitters, was placed in an anechoic chamber for testing. SI2 is exploring a number of custom applications for RIZE’s ink marking capability. Moreover, they are using RIZE to produce tabletop signs for sales purposes. They place the SI2 logo on the curved part as a visual way to inform customers about their 3D printing capabilities and applications. For more information on the RIZE 3D printers, please click the button below.